Tad's JTK.CA Poem Server: "THE ALAN PARSONS DOPPLEGANGER" & "COMFORT"
Every once in a while a moment happens in your life that you will cherish forever. is my all-time favourite musician. Now the story: Rogers Cable has been upgrading the cable wiring in my apartment building lately, and today was the final visit--a visit I will never forget. I opened the door, and could not believe my eyes. My cable guy was the doppleganger/spitting image/long lost identical twin of ALAN PARSONS. I told him, "You look just like my favourite musician, Alan Parsons." He replied, "Well, I've never heard that one before." Anyway I played a few Alan Parsons tracks for him, and he recognized his stuff, especially the song "Eye in the Sky" by The Alan Parsons Project. That didn't surprise me. Everyone knows that track. Anyway, the cable guy's actual name was Mark, and as he left, I said, "Thanks Alan...I mean Mark (with a wink in my voice)." He smiled at me as he left. What an absolutely wonderful memory to hold onto. linking to his myspace site. I showed Mark the picture and he said, "Yeah, I see how you could see a resemblance [to me]." who dresses and moves like me, at the grocery store. I think he even wears a backpack like I often do. and seeing the look on his face as I approach. poem--inspired by home sweet disaster zone (a.k.a. my apartment). When I clean, I do an immaculate job. "When" is the key word. of getting myself started; that's the challenge. I take comfort in my mess. And don't know where I'm going next. I can withstand your wrath. Where I'll finally be perfect, like Him. Jonathan (or Tad? or Jonathan Tad? or Tad Jonathan? in Freelton, Ontario, Canada (between Guelph and Hamilton). in an average of 2 minutes, 30 seconds. in the current millennium is 1 minute, 47 seconds. hit "Reply," and type away. Thanks. "Thanks for your prayers" and "Silent Page"
Subject: "Dad is feeling better! Thanks for your prayers" and Tad's JTK.CA Poem Server: "SILENT PAGE"
Thank you so much for your prayers for Dad. He has recovered from his health problems. I wrote the poem, "Silent Page," on January 1, 1998. Jesus, the author and perfecter of our faith..."
Leaving all power to the Sage. Help the Creator of the universe? Who can counsel the Wonderful Counselor? So He can give it back to me. I cannot explain God to God. Set the terms of God's unfathomable grace? Write my own life and a faith based on my own understanding. For what He writes on it. Jesus is writing on my white surface which He purified. Writes a poem in progress. I am but one of His poems in progress. But we each must be His silent page. And we are His paper. Dad has left the emergency room and is home again. He has been given medications to treat "a urinary tract infection" and "a low blood potassium level." His pneumonia seems to have left; hopefully it will stay away for good. He still has a cough, but he's had one for a long time; I think it's a chronic cough. Thanks for your prayers. Keep 'em comin'. 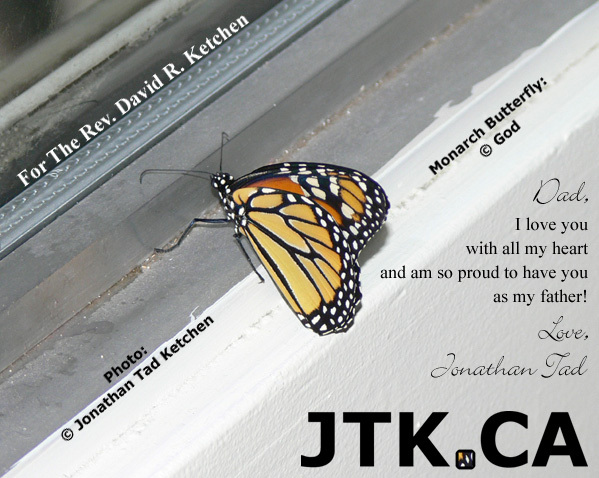 As a pastor, over the years, during Monarch Butterfly season, Dad has often done a children's story that spans over a few weeks in Sunday morning services. The kids (and adults) get to see the transformation from caterpillar to butterfly over that period. He just did it again recently. This is a photo I took of one of the butterflies in my parents' condo, before Dad set her free. Enjoy. My dad, The Rev. David R. Ketchen, has been being treated for pnemonia for a while now and is not getting better. The doctor told Mom to take Dad to the emergency room, so that is what she's doing. My dad, The Rev. David R. Ketchen, who drove almost a thousand miles to help me make it through my last week of classes during an academically dismal semester in college. I really appreciate your prayers for Dad. Thank you!